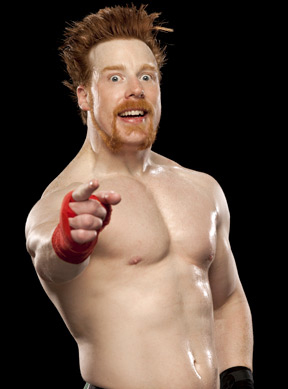 WWE superstar Sheamus A.K.A Stephen Farrelly was was born January 28th 1978 in Clonsilla Dublin Ireland. Farrelly's inspiration into a professional wrestling career came from watching both British wrestling from ITV'S World of Sport and American wrestling from the World Wrestling Federation on Sky One. Farrelly began training in Larry Sharpe's Monster Factory wrestling school in April 2002, alongside Tank Toland, Cliff Compton and Cindy Rogers. Six weeks later he officially debuted as a fan favorite under the name Sheamus. He soon suffered a serious neck injury after botching a hip toss which sidetracked his career for two years. Farelly soon developed his wrestling character by drawing Celtic mythology. In May 2004, still using the ring name Sheamus O'Shaunessy, Farrelly returned to wrestling at the newly opened Irish Whip Wrestling he then made his debut match for the promotion at their Mount Temple show on July 9 against Mark Burns, who he easily defeated. On November 13, 2006, O'Shaunessy appeared on the World Wrestling Entertainment (WWE) show Raw only to later receive a Pedigree from Triple H. This led to signing a developmental contract for WWE, at which point he relocated to the United States. On July 22, 2008 O'Shaunessy worked a dark match at a SmackDown taping, losing to R-Truth. The following year in May, O'Shaunessy began appearing at the Raw brand's house shows and on both May 8 and 9 he defeated Jamie Noble along with another dark match victory over Noble before an episode of Raw. About 2 years later on June 30, 2009 episode of ECW, Farrelly made his unannounced debut as a villain under the shortened ring name of Sheamus, quickly defeating a local competitor. Sheamus soon entered into a critically well-received rivalry with Goldust after defeating him on July 29. Soon after exchanging victories in the following weeks the two appeared on the Abraham Washington Show talk segment leading to a No Disqualification match on September 1 which was won by Sheamus. Sheamus made his Raw debut by defeating Jamie Noble and in the following weeks he continued to attack Noble causing him to retire. Sheamus then went on to feud with John Cena. Weeks after of their feud Sheamus earned a title opportunity on December, 13th 2009 at WWE PPV TLC (Tables Ladders Chairs).The match was a Tables match who ever goes threw the table would be declared the loser. Sheamus shocked the WWE Universe by putting Cena though a table making him the first ever Irish born WWE Champion. The next night on Raw the Slammys awards was held. Sheamus won the breakout star of the year award, winning the WWE Championship in only 3 months of his WWE debut. Sheamus then moved on to a feud with Triple H (his workout partner on the road). Sheamus would attack The Game week after week, until a match at WrestleMania 26 was made, Sheamus V.S Triple H. In a great match The Game came out on top but that wasn't the end of this rivalry. At WWE PPV Extreme Rules a street fight was announced and Triple H was attacked by Sheamus before the match backstage giving The Game a slight concussion and nerve damage. Triple H was able to continue the match where Sheamus utterly destroyed him. Sheamus then hit Triple H with his finisher the Brogue Kick (Bicycle Kick).Triple H suffered multiple concussions after the match putting him out for months.